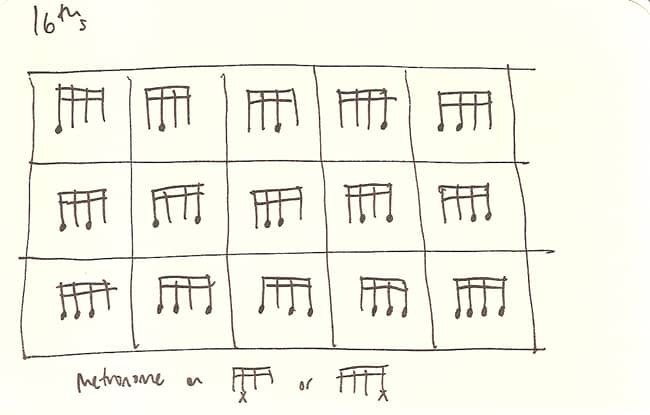 The diagram shows all the possible rhythms within one beat using 16th-notes. The noteheads are meant to be played/clapped, and the sticks without heads are supposed to be felt. I find that imagining a 16th-note groove help to lock in with the feel – as if you were practising along to your own internal drummer. If you’re up for a challenge, practise them with the metronome click on the second or fourth 16th. That’s a great way to work on making your time stronger and your rhythmic placement very accurate.